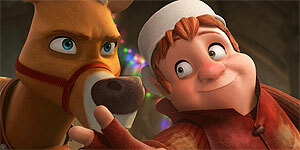 Voiced by a recognisable cast, Saving Santa is a pleasant and well-timed festive animation, but its unsophisticated storyline, general lack of humour and substandard soundtrack ultimately let it down. Directed by Leon Joosen and Aaron Seelman, Saving Santa stars Martin Freeman as Bernard, a humble little elf, whose sole job is to clean the reindeer stables at the North Pole. These days, Christmas has become so big that Santa (Tim Conway) has been forced to innovate, using a time machine developed by his cleverest elves to deliver presents to every home promptly. Naturally, Bernard dreams of bigger responsibility and when he creates a groundbreaking Christmas memory machine, he thinks his luck might change. Unfortunately for Bernard however, a curious elf breaks his invention, causing the North Pole’s power to fail and thus exposing it to the outside world (it used to hide behind a pioneering hologram, also developed by the smartest elves). Santa’s enemy, Neville Baddington (Tim Curry) sees this botch as an opportunity to steal Santa’s secrets and it’s up to Bernard to stop him and save Christmas. Saving Santa is a reasonably enjoyable Christmas animation musical, which younger children will no doubt find entertaining, thanks to its fairly attractive animation quality and festive colour scheme. Martin Freeman’s Bernard is a likeable lead character and Tim Curry is well cast as the angular villain, whose fate is unfortunately predictable. Unfortunately, older viewers will likely have trouble warming to this harmless animation due to its one-dimensional storyline and general lack of humour (the only fairly funny joke involves a word play on ‘blip’ and ‘blop’ and even this is recycled in the third act). What really doesn’t work though is the film’s musical element; the lazily written songs feel like they were made up on the spot and are far from catchy. And despite him working as the down-to-earth elf in the majority of scenes, Martin Freeman’s singing vocals just aren’t suited to a kids’ animation about Christmas. The prominent mixture of British and American accents for a film set in the North Pole is also a little puzzling and off-putting. Saving Santa is a fairly enjoyable but rather flawed and forgettable Christmas animation that will struggle to charm the whole family. Thankfully though at just over 80 minutes long, it doesn’t overstay its welcome and so younger viewers shouldn’t have trouble staying tuned in.